You are here: Home / Our Animals / Chickens / What Causes Lash Eggs & Salpingitis In Backyard Chickens? What Causes Lash Eggs & Salpingitis In Backyard Chickens? If you’ve never heard of lash eggs, then it’s something you should know about as a backyard chicken owner. So, what are lash eggs anyway? Can you prevent lash eggs? 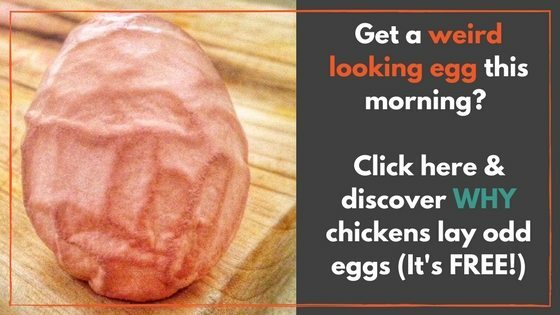 Although lash eggs are not very common, they do happen, and they are an indicator that your chicken probably has an infection and you might want to take her to a vet. If you’re wondering causes lash eggs, then the first thing you should know is despite their name, lash eggs aren’t really eggs at all. A good lash egg definition starts with their cause: Lash eggs are the result of Salpingitis—an infection and inflammation of the oviduct, which causes a hen to slough off pus and other material accumulated in her body because of the infection. As the material accumulates, it passes through the oviduct and is laid by the hen. Humans can get Salpingitis, too, and in humans, it’s an inflammation of a woman’s Fallopian tubes. As of the time of this post, the reasons why Salpingitis occurs in chickens are not known (the exact parthenogenesis), although identified risk factors might be the fact that industrial farms keep chickens so close together. Another potential cause are hormones. According to the Merck Veterinary Manual, Salpingitis and the resulting lash eggs can be caused by different bacteria, including Mycoplasma gallisepticum, E. coli, Salmonella, or Pasteurella multocida. The Merck Veterinary Manual does not recommend a specific treatment, although studies suggest antibiotics might work to cure salpingitis. Because several different bacteria can cause salpingitis, the antibiotic to prescribe depends on the cause. You should consult a qualified poultry vet. Lash eggs are pretty gross – they’re comprised of a few things, including pus from the infection, and sometimes egg material or possibly tissue. It is comprised of layers of this material that’s accumulated in the oviduct. 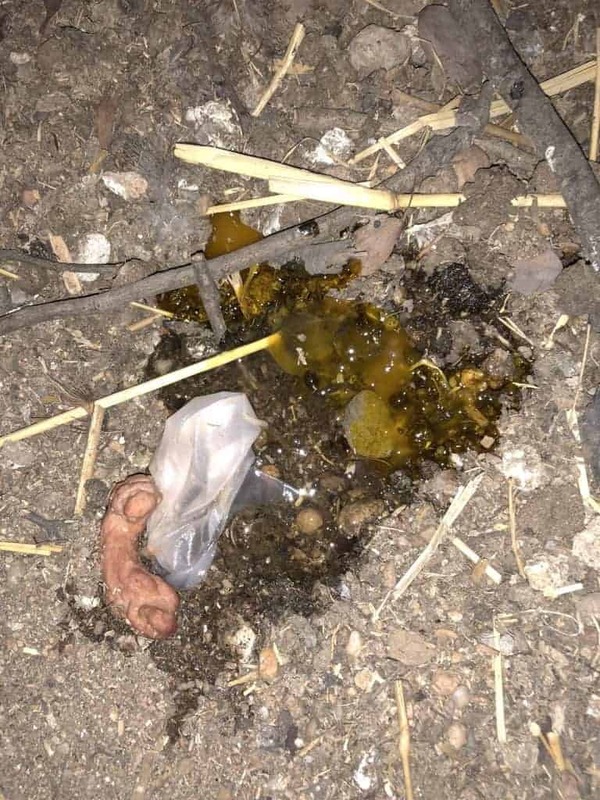 Lash eggs laid by your backyard chickens can be soft or hard, and you might find just a small bit of pus-like material or it might be a large object that closely resembles an egg. When you cut it open, you might be able to see the layers of material. I’ve seen lash eggs of all sorts, from ones that look simply like a broken soft shell egg, to one that’s a large hunk of disgusting, compressed pus. Lash eggs are generally shaped something like eggs, and the reason for that is because they travel through the oviduct. So, lash eggs can take a few different forms, but the underlying commonality is lash eggs are laid like normal eggs, and you might even find them in your flock’s nesting boxes. Now, there’s a bit of controversy about what to do if your backyard chickens lay lash eggs, and you might see some advice on Facebook or social media that’s conflicting. One resolution I see doled out is to cull the hen that lays lash eggs. The reasoning behind this idea is that if she lays a lash egg once, she will do it again, making her an unproductive member of your flock. I don’t necessarily agree with this advice. Largely, this advice is intended for the egg industry, which values the eggs a hen lays more than her life. For a large egg farm, from a financial perspective, it makes sense to dispose of a hen who might be sick or not perform, since the bottom line reigns supreme. For a backyard chicken keeper, however, this advice might not be necessary, and you might not necessarily want to dispose of a hen that lays lash eggs. 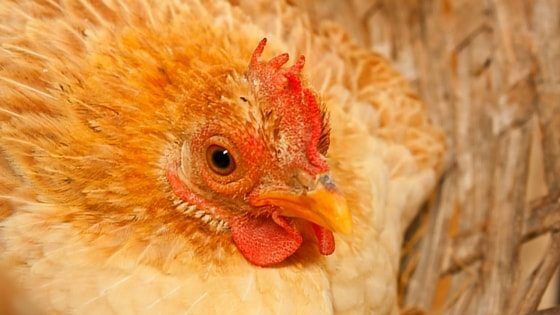 If your chickens are acting normal and seemingly otherwise healthy, then culling her is not your only option. For a hen that lays lash eggs, treatment can be sought from a qualified poultry vet, who might suggest putting her on antibiotics to see if they clear up the infection. The bottom line is lash eggs are the result of an infection – consult your vet to see if the infection and your chickens can be treated. 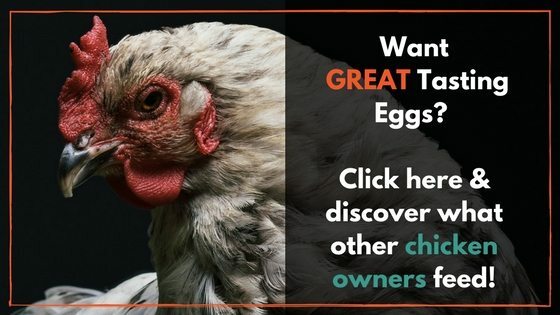 Now, the thing with backyard chickens is they often hide how sick they are until it’s too late to help them – but that does not mean if your hen lays a lash egg that you shouldn’t at least get her seen by a qualified poultry vet. While some hens do die from Salpingitis, many don’t, and are able to return to a normal laying life after the event. I’ve seen hens return to a perfectly productive life after laying lash eggs. She might never do it again, or she might lay regular eggs or a while then lay another lash egg. It’s hard to know what each individual hen will do. Unfortunately, there’s not much you can do to prevent your hens from laying lash eggs. Even if your hens are healthy and eat an ideal diet, they can still develop Salpingitis. If you don’t know which hens in your flock are laying lash eggs, then your best bet is to observe your flock to see if anyone looks “off” or sick. If everyone looks healthy, then just continue to keep an eye on them. If you think your hens might have laid a lash egg, and you’re worried, then your best bet is to bring her to a qualified vet. Now, if you’re wondering can you eat a lash egg, then the answer is no. A lash egg is an accumulation of pus for the most part, and you definitely don’t want to be eating it. I would toss it in the trash or hold onto it if you want to take your hen to the vet. Since publishing this article, I’ve had a few people ask if it’s contagious. I’m not a vet, so I recommend consulting one for a definitive answer, but since salpingitis is an inflammation of the oviduct caused by an infection from E. coli, Salmonella, and the like, I personally wouldn’t be concerned about it being contagious. Think of it like this—if a human woman had salpingitis (inflammation of her Fallopian tubes), would you be worried? Since chickens naturally carry a bacteria load in their bodies, they’re already at risk for the infection. If they get a laceration or some small tear in their oviduct (or some other way for the bacteria to enter), it’s possible salpingitis might develop. Have any of your hens laid lash eggs? Leave a comment below! Lash eggs can mean trouble for your backyard chickens - here's what you need to know to be prepared. Thanks, Lisa! Glad you like it! Great article! My hens have been having problems laying and yesterday I found a lash egg in the nesting box. Still looking for a vet that can help with my girls. I’m so happy I found out what is going on and maybe there is a solution! Love my girls! Thank you for the article it has explained what I found in the coop just the other day! I will talk to my vet. Hi Wen. glad the article helped and that your girls are happy and doing well. Keep in touch! I haven’t seen any of those, but a friend of mine had a hen lay an egg that was black inside. Is that related? Usually eggs that are black inside have some sort of bacterial growth in them that rotted the yolk and albumen. Lash eggs are different, it’s a build up of pus and other stuff, and not really an egg at all. Are fart or fiery eggs different? i think any infection can benefit from a high vitamin A diet. i have cured eye infections in cats with vitamin A added to their food, and cured pneumonia in myself with Vitamin A supplements (i am allergic to most antibiotics – and the one i can take, penicillin, was not effective in curing the pneumonia). backyard chickens sometimes don’t eat enough dark leafy greens, raw corn, and cooked squash and sweet potatoes, but these foods might do the trick. also vit A supplements (5,000 i.u. dry) added to raw/rolled oats might also help. Great ideas! Can’t go wrong with fresh, leafy greens! I have one that has been laying eggs since April of 2015. She seems otherwise healthy. I had heard that salpingitis is not a treatable problem. Hi Curt, it really takes a vet to determine whether the infection a particular hen has is treatable or not. Some hens die of it, but some hens don’t have an issue the rest of their lives. I”ve read that you shouldn’t feed chickens potato peels. Are they alright if cooked? Personally, I avoid feeding all potato peels. The green peels contain a toxin that’s poisonous to chickens, and since it’s hard for us to know whether a peel has turned or not, I just avoid them altogether. Is this infection contagious in anyway to the other hens? sorry might sound like a silly question but I’m new to having chickens. Not exactly. Salpingitis is caused by bacteria, such as E. coli and Salmonella. All chickens naturally are carriers of both E. coli and Salmonella (among others). In the case of Salpingitis, the bacteria gets out of control (to put it simply) causing the infection and inflammation. It’s possible for one hen to infect another with the bacteria (transmission through manure for example), but the actual Salpingitis is caused by some trigger factor (like a microscopic laceration in the oviduct as a broad example) that allows the bacteria to get out of control. I hope that makes sense. Thanks for asking the question, I’ll update the article to answer this question, since I’m sure other people will wonder the same thing as well. Hope this helps. Our hen Violet has been producing lash eggs for the last six months. She’s a four-year-old ISA brown and had been a very productive layer. I suspect the problem started when a new addition to our flock introduced a respiratory infection back in early 2014. Violet became very ill and, although she recovered with the help of antibiotics, she was left with persistent diarrhoea that didn’t respond to treatment. Despite the diarrhoea, she seemed otherwise happy and healthy and was laying nearly every day for the following two years. In December 2015, Violet displayed initial symptoms of lethargy, fluffing of feathers, disinterest in food – very similar to an eggbound chicken. In fact, that’s what I thought I was dealing with and treated accordingly with warm baths and calcium. However, no egg was ever produced, Violet lost weight, and her comb turned pale and droopy. About three weeks later, she expelled the first lash egg. Not recognising the strange mass in the laying box, but knowing precisely which hen had produced it, I googled extensively and the results were discouraging. Most sites indicated that salpingitis was not a treatable condition and that death would follow quite quickly. As Violet is a much-loved pet, I took her to our vet, and he recommended worming and treating with Doxycycline Hydrochloride for 10 days, which I did. She has always been free-range, and fed an organic grain mix, with shell grit in a separate bowl, plus loads of organic fruit and veg from our garden and treats of cheese, yoghurt and kids’ leftovers (including beef and fish but never chicken!). I am happy to relate that Violet has been steadily improving in health and gaining weight and the diarrhoea has finally cleared. She has “laid” another five lash eggs. She hasn’t laid a normal egg since the salpingitis started. Her comb still droops to one side, but it’s regained its normal rosy colour, and in every other respect she looks terrific. None of our other six hens have been affected by the condition, so I would certainly not rush into culling the flock. Thank you Chay! This was so informative and comforting. I just found a lash last week and another 3 today. None of my hens are acting odd but I lost our first hen 2 weeks ago and we could not determine the cause. I am panicked. can you please tell me how much doxycycline you were told to administer and how to do it? Also- I have never wormed- how do I know if I need to do this? Thanks for the information.. I do have a hen that laid a couple of lash eggs a few months ago. I have three hens and have not been able to differentiate which one it is. They are all thriving and healthy. Since the couple of lash eggs, she has laid eggs with essentially no shell but otherwise they are shaped like an egg etc. She does occasionally lay a normal egg other than it will be white in color and not the normal brown egg. I have read so much conflicting information about lash eggs. We do not eat the white eggs that we find in the boxes. We discard them. I have considered culling her but think we will just keep her. I was primarily concerned that keeping her could be a potential threat to the other hens. Apparently that is not the case. They all seem healthy otherwise? Thank you all for this information. I am a chicken newbie. I have 2 RIR and 2 EE all about 5 months old and 1 black australorp 4 years old we adopted about a month ago. All was going well until one red was in the nesting box sometimes more than an hour without laying for about a week. I also had found what looked like busted yolks (no shells) in pine shavings in roosting area. I thought she was egg bound so gave her a warm bath and put her in a large dog kennel then after about 2 hours I found what I now believe was a lash egg(s), gross, semi hard, white things (there were 2). She seemed better for about 10 days then she was fluffing her feathers, diarrhea and wasn’t as energetic as usual and still going to the nesting box without laying. After much internet surfing I figured she had salpangitis and most of the reading was depressing and negative. Local chicken vet is out of town until 15th November so I went to local feed store and got duramycin and started dosing her (hopefully correct amount that info was hard to come by), gave her 3 warm Epsom salt baths and kept her inside for 5 days. Now she seems back to normal running across the yard eating and drinking. I will watch to see if she lays. I just hope I have done all I can until the vet comes back. I just don’t want her to be in pain. Any other suggestions to ensure her comfort and health will be greatly appreciated. I am pretty sure one of my girls just laid a lash egg. Just found a round firm lump in the laying box (about the size of a wallnut), quite rubbery and when I cut it in half it had ring (a bit like a tree trunk) so got onto google straight away and found this explanation. One of my girls (my only white hen) was not well about 2 weeks ago, just sitting on the ground even at night not going into the coop. I gave her a feed of yoghurt and apple cider vinegar and within a couple of days seems much brighter. About 3 days ago she started moulting badly, at first I thought something had got hold of her, but she seems to be quite OK and eating normally. This morning I found this lump thing in the nesting box so I am only assuming it was laid by her. She’s not easy to catch so will leave trying to catch her to take to the vet unless she seems not well again. I’ve had 2 lash eggs in the last 2 months . Not sure who laid them ,but one , a Rhode island Red about 16mths old, has died. She was limping shortly after the lash egg appeared,thought the young dog may have scared her ,causing a hip issue. She began to loose her balance and just got weaker. It’s been very hot here ,over 36C for days. There is now another chook, an Isa brown who’s over 3yrs old, and not looking good this afternoon, puffed up and has gone to bed .Both chooks had runny droppings. The local vet doesnt have any idea what is wrong. I will try to get some antibiotics from the farm store tomorrow and hope it helps. We are in South Gippsland and have lost our chooks to foxes ,this is worse thinking shes in pain. Hope it was the RIR who laid the lash eggs and that the Isa brown just has diarrhoea. Our IB Violet (who laid a number of lash eggs over a period of many months) was very lethargic the last few days of her life but not limping or losing balance… just sitting down most of the time.